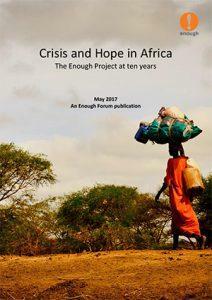 This Enough Forum paper, “Crisis and Hope in Africa: The Enough Project at Ten Years,” by Colin Thomas-Jensen is published as part of the Enough Project’s 10th Anniversary Commemoration Week. In late 2006, I spent a weekend at a hotel in downtown Philadelphia with an extraordinary group of human rights activists. The meeting, convened by the Bay Area-based foundation Humanity United, was the first step toward building a new organization—one that would use field-based research and analysis of armed conflict and focused advocacy to generate greater political will in the United States and elsewhere to take bold policy decisions to end genocide and mass atrocities in Africa. Three years earlier, the Government of Sudan had begun a military campaign against its citizens in Darfur. The atrocities were met with widespread global condemnation and launched the Save Darfur Coalition, a major grassroots movement focused on ending the killing, which the George W. Bush administration called genocide. Our goal in Philadelphia was ambitious, borne not just from a collective sense of outrage over the brutality of conflicts at the time across East and Central Africa, but also from the belief that the strong bipartisan constituency built around ending genocide in Darfur could be a game-changer in affecting policy change on a broader agenda.